The day started off well enough. I took a 7am Pilates Class and came home with quite a sweet build up… it was an intense hour long session. Mid Morning 8oz Juice Carrot, Apple, Broccoli Juice. HINT: Broccoli contains a great amount of beta carotene as well as many other valuable nutrients that make it a powerful cancer-fighting food. 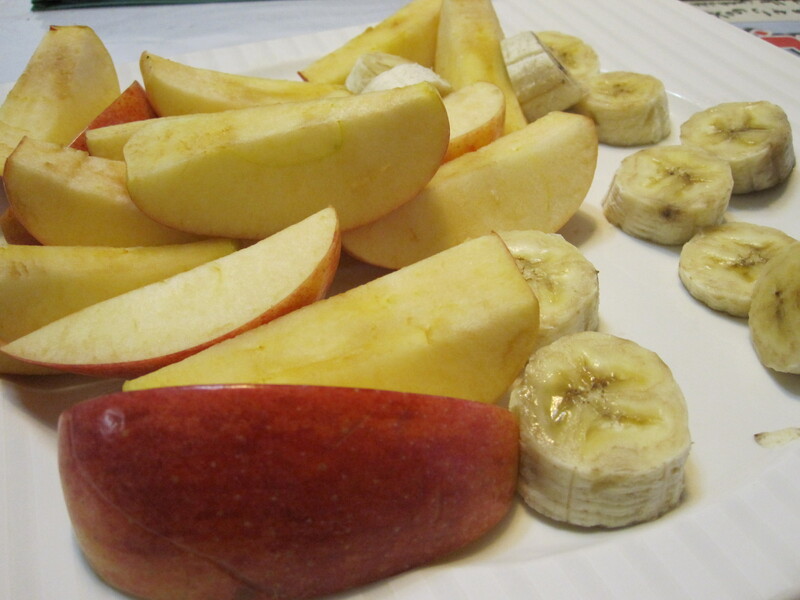 Apples are the only fruit that can be used with either fruits or vegetables. I went ahead and packed a bag with the Mid Afternoon 8oz Juice of Carrot, Cabbage, Celery Juice and a bottle of premixed Barley Max Powder for lunch. Lunch: Nectarines until satisfied… but I didn’t have any at home so I made Mike stop at a Whole Foods while we were out. 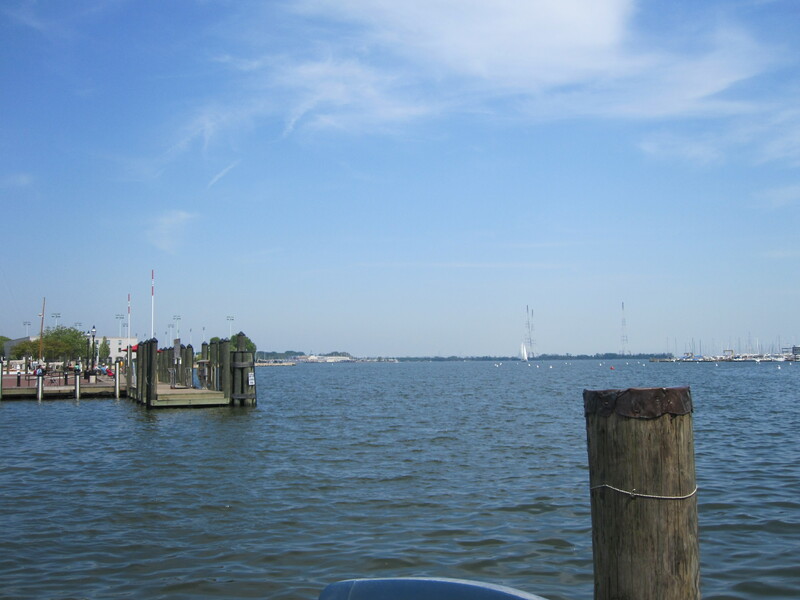 Mike wanted to drive over to Annapolis for the day and have lunch out there at the Marriott Hotels Restaurant on the Harbor. Before we even got to Annapolis, I had the Barley Max and the Nectarines… and I still felt hungry. So at the restaurant, I ordered this green salad and put Olive Oil and Vinegar on as dressing. I was quite big, so I unfortunately ate about half of the salad… munching on the Cucumbers, Carrots, Onions and Tomatoes mixed in there. Mid Afternoon 8oz Juice Carrot, Cabbage, Celery was on the road…. and it tasted really strong! HINT: If your system is acidic this juice may cause you to feel gassy. At home… I had my 1tsp Barley Max Powder 30 minutes before dinner. 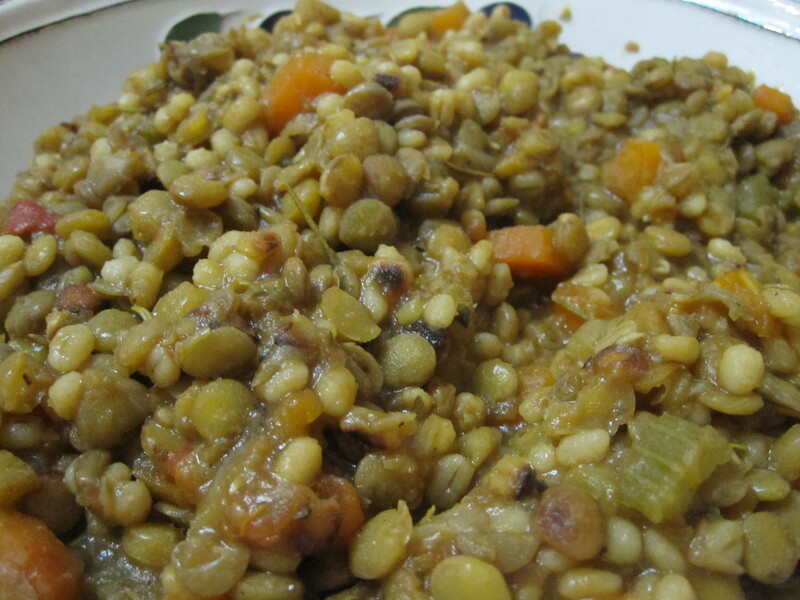 Then I started preparing the menu for dinner… It had been a while since I made the Lentil, Barley Stew (both Mike and I love) so it was exciting. Along with the Lentil Stew I made a Broccoli Mix. Directions: Wash vegetables, cut broccoli florets, cube tomato and slice red pepper. Peel and chop cucumber, chop onion fine, dice celery then combine. 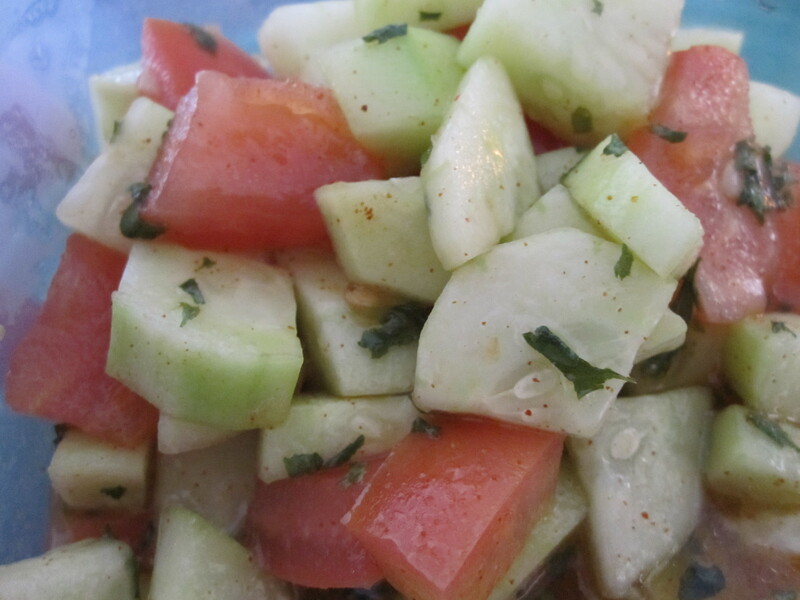 Prepare a dressing: 1 peeled medium tomato in the blender, adding 1/3 cup of sunflower seeds and blending until creamy. 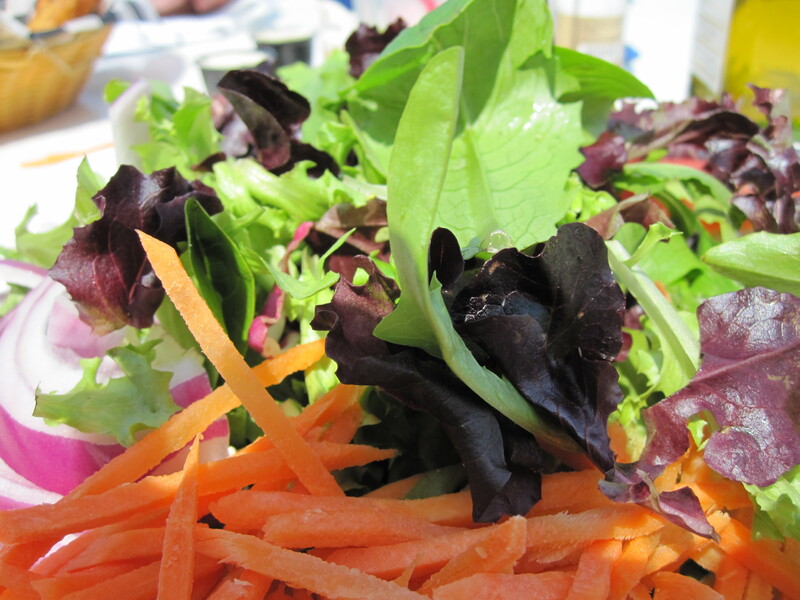 To serve, make a bed of fresh leaf lettuce greens, add a layer of vegetables, top with fresh dressing and add a sprinkle of sunflower seeds. Directions: Peel and dice tomatoes, chop carrots and minced garlic. Dice celery and onion. In a soup stock pan, bring lentils, barley, onion, garlic, celery, carrots and vegetable stock to a boil, reduce heat to lowest temperature, cover, and simmer for 35 minutes. Add the tomatoes and seasonings, cover and simmer 20 to 25 minutes longer or until the lentils are tender. It was soooo good… and I’m wondering now, why I hadn’t made the stew before NOW!!!! 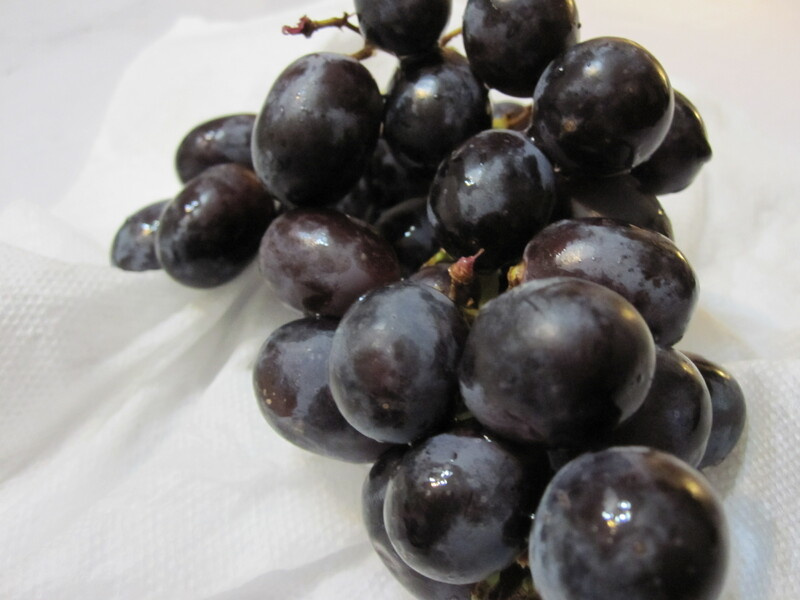 For a dessert, I had some Dark Grapes and that hit the spot. Today, I’m embarking on the second stint of the 14 Day Eating Plan. 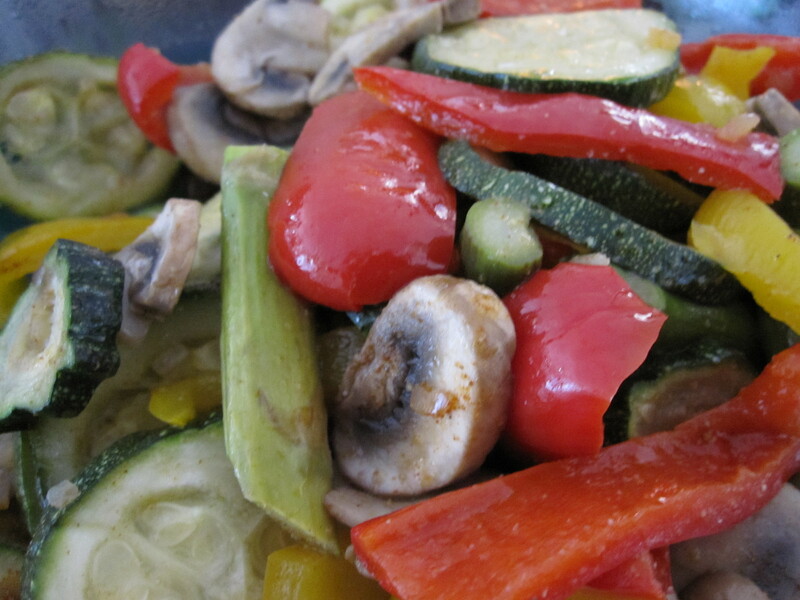 Simply put, this Hallelujah Acres Diet is raw fruits for lunch and raw vegetables for dinner. The vegetables and fruits are cleaned or peeled and eaten whole, without much preperation, with Barley max and sometimes carrot juice before each meal. I am also including my regular Pilates workouts which I’ll be doing 4 days a week and then incorporate walking, weights on my own. Well successfully, I started the day by making my Juice with Carrots, Cucumber and Celery. 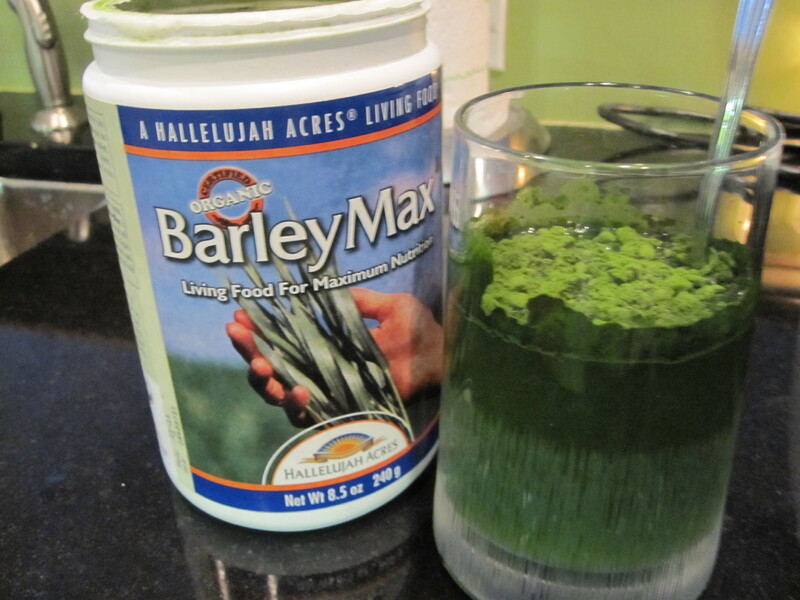 Breakfast: 1Tsp of Barley Max Powder mixed into 4-8oz glass of distilled water. And that’s what I did.. I sat down about an hour after I took the Barley Max and had two Apples for lunch. I have to say, I am feeling the mid afternoon hunger pains!!!!! I’m thinking about dinner and what is on tap for the menu. A Vegetable Salad and Raw Gazpacho Soup! I’ve finally gotten a juicer away from home… and this morning I made some juice. YEAH!!!! I got a late start, because Pilates class started at 10:00 this morning. So by the time I got the Carrots, Celery, Apples, and Beets from the local Giant Grocery Store and made the juice, it was noon. So now, I’m not that hungry but I’m getting a craving for something in my belly. I’m still reeling over the fact that my muscles are aching a bit from Pilates. It’s a good feeling and one I enjoy having. Because it lets me know I’m working/ridding my body of the fat!!!!! We left before dawn from Florida on our way to Potomac, Maryland Friday morning. Luckily I Juiced my Carrots, Celery, Apples, and Beets Thursday night, because all I was good for this morning was to get ready, go and sleep in the car. Just outside of Jacksonville, in Georgia we stopped so Mike can walk, wakeup, and get something to eat. He got me a Hash brown from McDonald’s which I devoured and then closed my eyes again until South Carolina. We stopped to get gas, and that’s where I asked Mike to Stop for Wendy’s, where I got a Side Salad and Baked Potato. I ate that for lunch and then shortly thereafter, I took over driving. We did really well on time, only stopped for gas and for Mike to stretch his legs a little. One of those stretches, I found myself in line at the Dairy Queen for a Turtle Blizzard. I just had such a horrible craving for something sweet, and Dairy Queen was staring me in the face.! I also got some Chex Mix to munch on too. Then around 6:30pm we arrived at the house here in Potomac and unloaded the car and settled in. I was hungry, so I had a little bit of the Lentil Soup I made before we left and some Hummus and Whole Wheat Bread. Both of those tasted a bit tart…. and that was the end of my eating. We settled down from the drive and hit the hay pretty early. I couldn’t wait to wake up and go to Pilates this Monday morning… since I didn’t go all weekend and I ate Chocolate Dove Bars the night before! It was a great work out at this morning’s Jump Board Pilates and my legs are definitely feeling the burn, even now. After the workout, Mike and I got an early start on getting some errands done. We hit up the bank first and then it was off to the post office, where I check the P.O. Box. We drove all the way out to Virginia to drop off the dry cleaning and back tracked it to Tyson’s Mall area so we can get lunch. Mike likes to go to the Olive Garden Restaurant off Leesburg Pike in Tyson’s area. I got my regular Minestrone Soup and Salad combination. I just love their Minestrone Soup, and today it was even better than the last time. Again, I indulged on two bread sticks during my fairly healthy meal. If only Olive Garden could switch to Whole Wheat Bread Sticks, that would be ideal for me!!!! 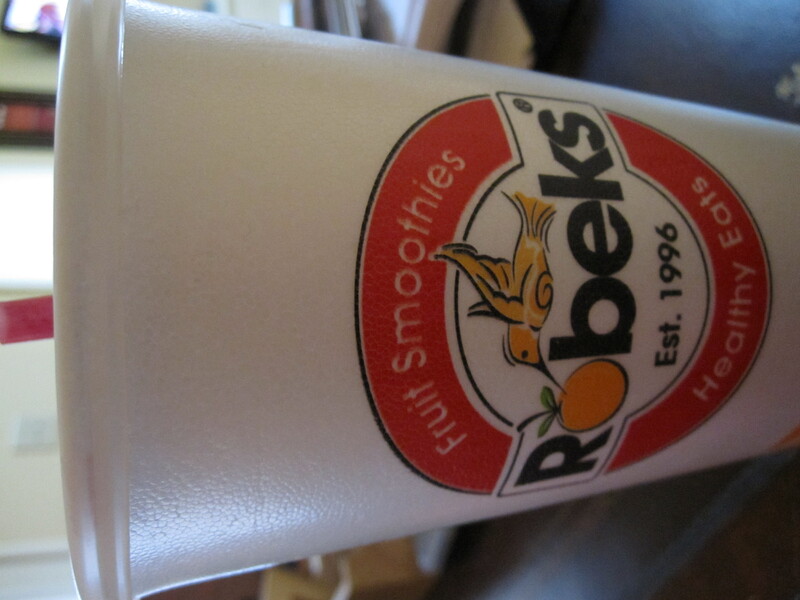 Later, I had a sweet tooth so we stopped off at Robeks for a smoothie. I got a Berry Burst Smoothie with an appetite suppressant boost. Yum Yum Yum! We made it home just in time for Mike’s son to get home from school, and he had a little buddy with him. 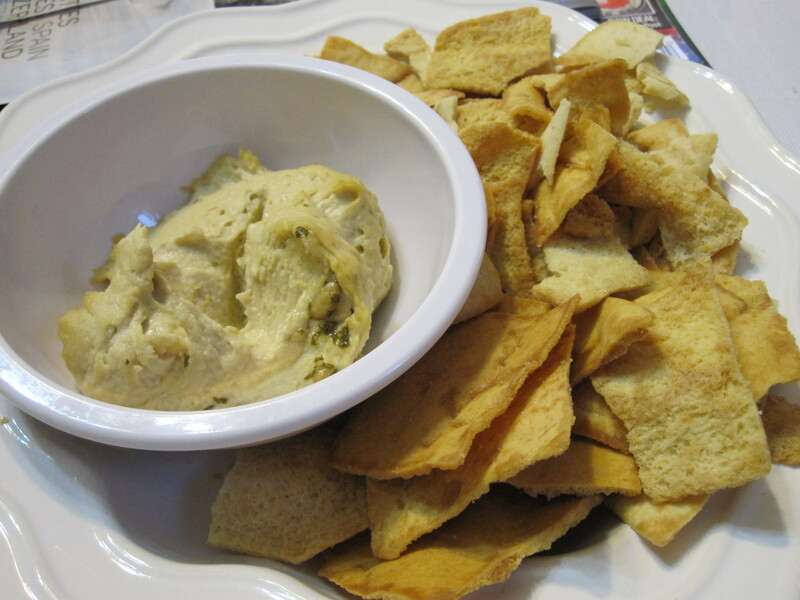 So I decided to cut up some Apples and Bananas and I made a side dish of Pita Chips and Hummus for the boys to snack on… and we’re still snacking on them. I’m not sure what’s for dinner. I took my Carrot Juice with me, while I did my running around this afternoon, which means I didn’t grab lunch before I left. But good thing happened along the way, one of the magazines I picked up to read at one of my appointments had some really good recipes. They both looked really good, and were in my requirements of eating only Raw Foods. Plus, I wanted to eat light, because the scale is not my friend these days.!!!! So I decided to make them after I got home. 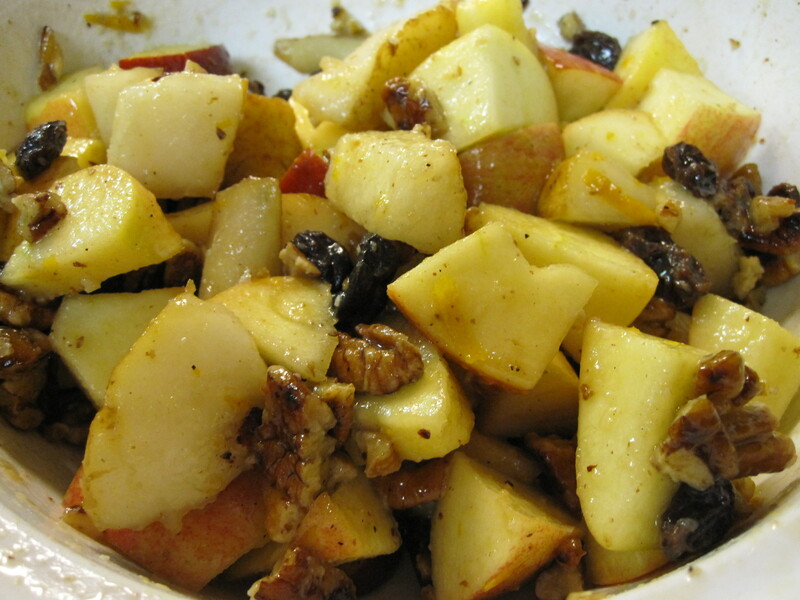 There was the Apple, Pear and Walnut Salad for which I had all the ingredients. And the Whole Grain Rigatoni recipe I had to do some modifications with. The Rigatoni called for Cheese(no cheese please), I didn’t have Crushed Red Pepper or Cauliflower and I didn’t use Rigatoni Pasta. So in place of those two ingredients, I used Cheyenne Pepper, Paprika and Asparagus. And amazingly, they were both easy and fast to prepare. I got home around 3p.m. and the food was ready by 3:30ish. In a large bowl whisk together vinegar, orange juice, zest and raisins. Core and cube apples and pears. Add fruit and walnuts to a bowl and drizzle with oil. Toss well to combine. Season with salt to taste and refrigerate for one hour before serving. Bring 6y quarts of water to boil in a large pot and add 2 tbsp. salt. In medium saucepan, heat oil; add onion, mint and Paprika/Cheyenne Pepper. Cook until soft, about 5 to 6 minutes. Meanwhile, chop Asparagus into 1/4-inch pieces and throw all the pieces into the saucepan with the onions. 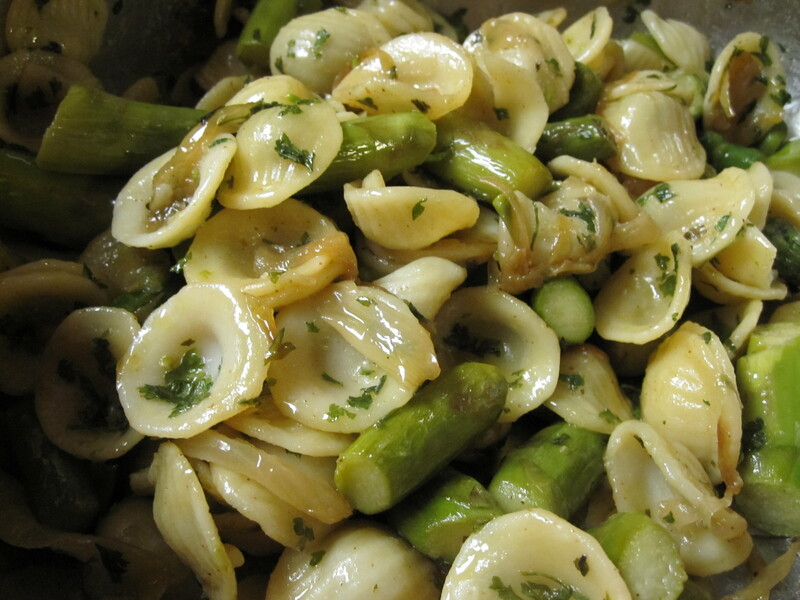 Lower heat to medium and cook, stirring regularly for 12 to 15 minutes, until Asparagus is softened. Cook Pasta according to package instructions until al dente and drain in colander. Reserve some of the water and add to the Asparagus, Oil & Onion mix. Toss hot pasta and Parsley with the rest of the mix already in the pan and serve immediately. For dinner, I had another new recipe. 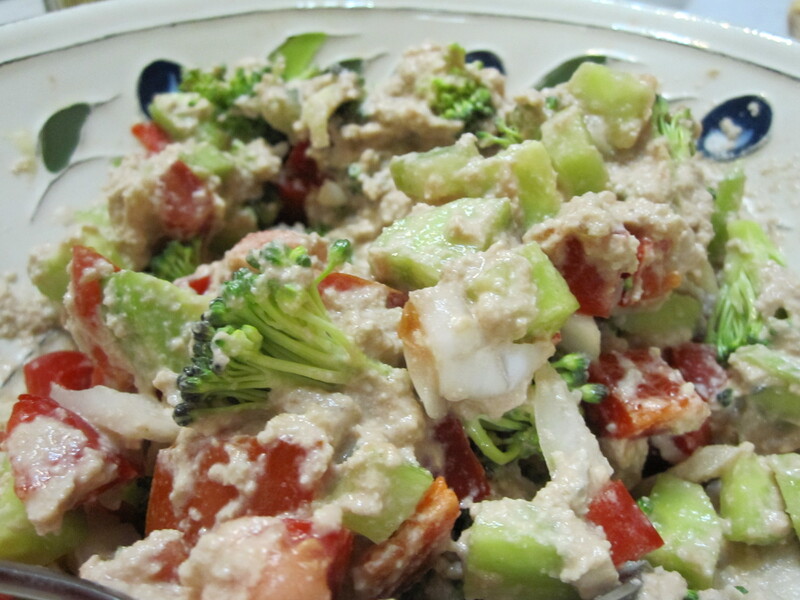 I made Fresh Vegetable Salad mix with an Oil and Vinegar Dressing. Chop up Pepper, Avocado, Asparagus, Tomato, and Cucumbers into 1/4-inch cubes or bite sized pieces. 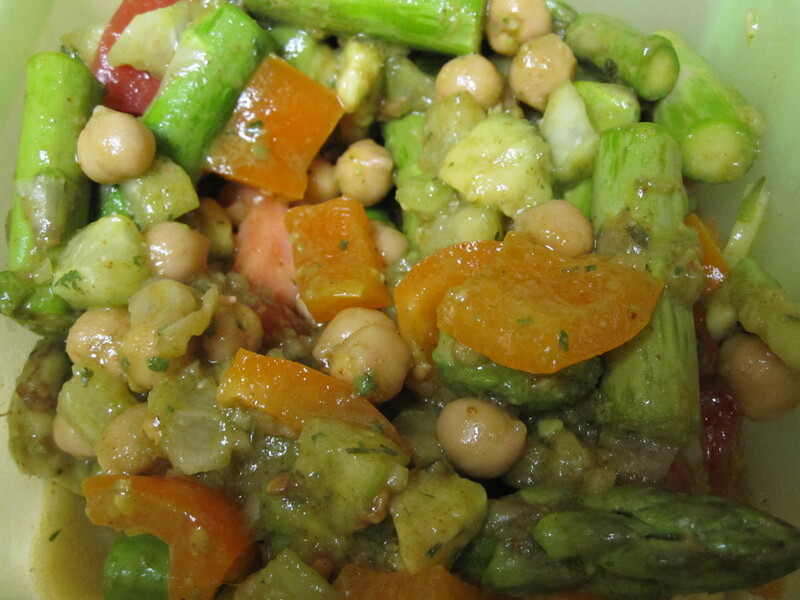 Add Oil, Vinegar, Chick Peas, and Seasonings and toss to coat the vegetables.